Use up all of your homegrown basil and parsley with this easy to make Homemade Basil Walnut Pesto that can be savored on meat, vegetables, pasta, sandwiches and more. Having a garden is great, but it is important to make sure you are actually using up all of that produce up so that nothing goes to waste. Making pesto is a great way to preserve your homegrown herbs like basil and parsley so that you can enjoy the fresh taste and flavorful, nutritious health benefits all year long! If we are friends on Instagram, you already know that I am a passionate gardener. 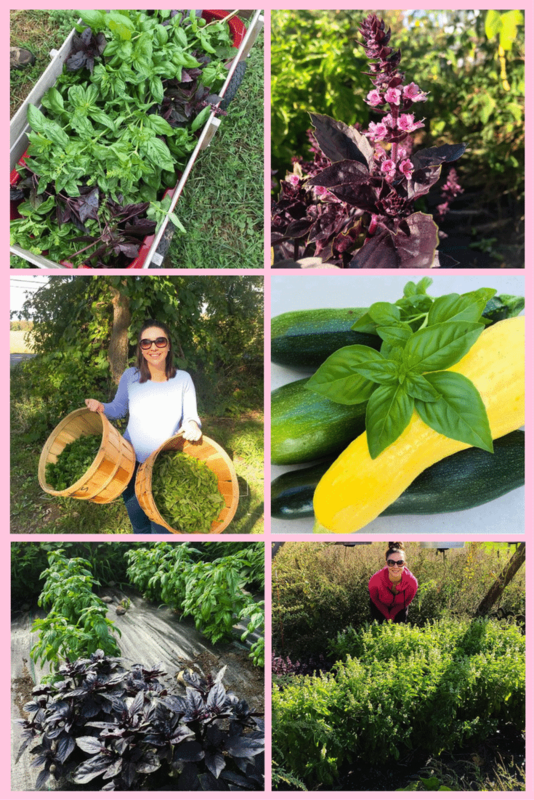 Over the years, my husband, 2-year-old son and I have created what I lovingly call The Millennial Garden where we work hard to plant, grow, and harvest a lot of our own food. As a registered dietitian, I am always promoting the benefits of plant-based eating, and truly believe that there is no healthier food than the food you grow yourself in your own back yard. This year was an incredible year for our basil (and most of our garden in general) despite the drought we experienced here in Upstate New York. I am especially proud of this harvest because I started all of these basil plants from tiny seeds back in early March. Which, is a reminder to all of my readers out there, if I can do it, YOU CAN TOO! I am not saying gardening is easy, but it is certainly doable, and 100% worth it. Growing all of this basil and parsley is great, but if you don’t have a plan on what to do with it, it can go to waste quickly. Before planting this much, we already knew that we wanted to make homemade pesto. Pesto is an Italian sauce made with basil, garlic, nuts, and cheese, and the flavor is incredible. It pairs well with just about anything, including meats, vegetables, pasta, and bread. 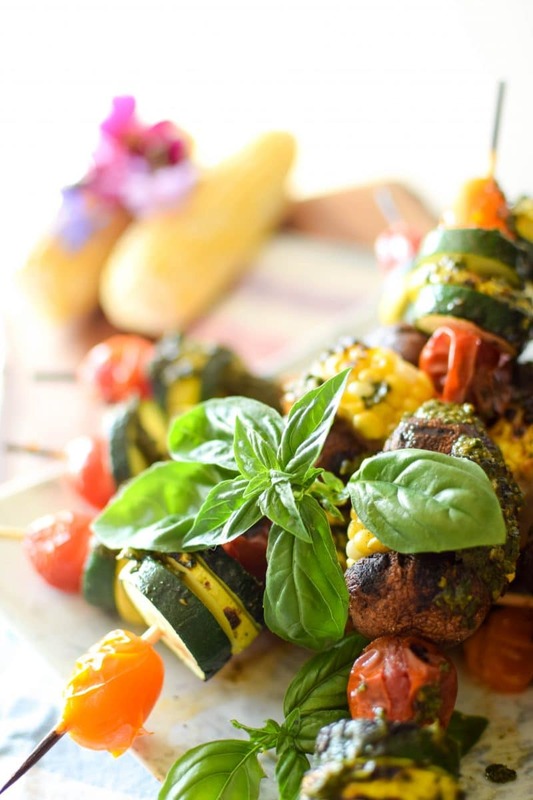 Try it on grilled veggies, like these Garden Harvest Veggie Pesto Skewers. The best part about this recipe is that if you make it in large quantities, you can individually portion the pesto and then freeze it so you have easy-to-use packages all year long. To freeze, we simply pour the prepared pesto into 8-ounce plastic cups and freeze. When the pesto is frozen solid, we pop it out of the plastic cup and use a vacuum sealer to seal it up, but if you don’t have a vacuum sealer you can place into a freezer bag and squeeze out the air. Simply dethaw in the refrigerator when ready to use. If your walnuts are not yet toasted, you will want to toast them prior to using them in this recipe in order to capture their deep, rich flavor. Start the oven broiler. Evenly spread out the chopped walnuts on a foil-lined baking sheet. Place the baking sheet under the broiler and watch closely, stirring every 2 minutes until perfectly golden brown. Remove the walnuts from the oven and add to the food processor. Add the garlic cloves and fresh Parmesan cheese to the food processor and begin to pulse in 5-second intervals until the walnuts, garlic and cheese become a fine consistency. Add the basil through crushed red pepper to the food processor. Turn the food processor to medium-low speed and very slowly pour in the olive oil. Continue to blend for an additional 60 seconds or until all of the ingredients are broken down and well incorporated. Store the fresh pesto in a mason jar in the refrigerator or freeze according to the directions above this recipe.